As devastating as the more recent disasters were, the waters of the Willamette River have never risen higher than they did in June 1894. 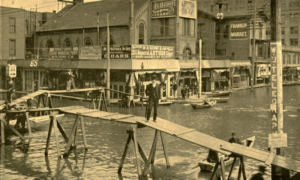 Turn-of-the-century Portland sprung up as a vital economic hub due to its position at the confluence of the Columbia and Willamette rivers, a location that could be precarious when torrential rains fell. Severe spring snow melt and summer downpours combined that year to push the river deep into downtown, setting a record 33-foot high watermark that still stands today.